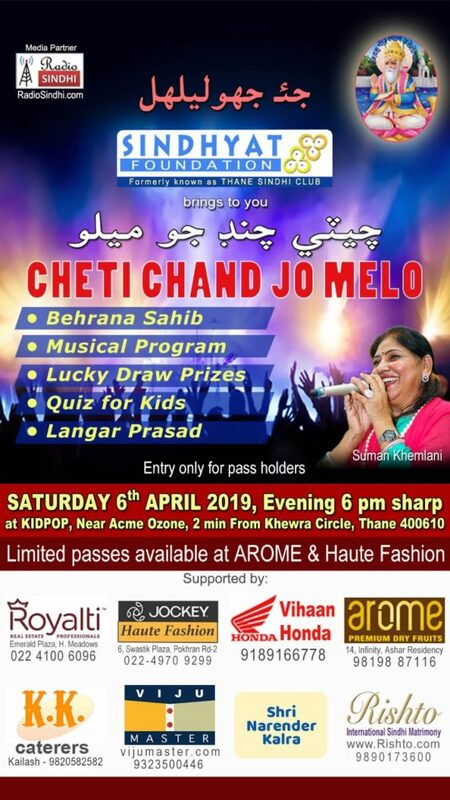 Sindhyat Foundation, earlier known as Thane Sindhi Club is bringing to you Cheti Chand Jo Melo 2019. Behrana Sahib & Cultural Sindhi program is organised at Kidpop Centre School on 6th April, 2019, Saturday at 6:00pm sharp. Kidpop school is very close to Khewra Circle and Acme Ozone. Passes are compulsory to attend the event. There is map provided behind the passes to reach the venue. We have also organised Autorikshaw shuttle service between Khewra Circle and Kidpop School. This year we have invited Famous Suman Khemalni and orchestra party to perform and entertain the audience. There are Sindhi Fun games, prasad & Langar organised. We look forward to meet you at event. Wishing you all a very Happy Sindhi New Year. Event is supported by Arome, Royalti, Haute Fashion, Vihaan Honda, Rishto.com, VijuMaster.com, Shri Narender Kalra & K.K. Caterers. limited passes are available at Arome & Haute Fashion. After the successful Events of Cheti Chand & Sindhi Comedy Drama, we are excited to inform you about our next Sindhi Event. To bring our Sindhi community together and know each other, we are organising “Mata Jee Jyot” on 6-Oct-2013 (Sunday). You are cordially invited with everyone in your family including children and have blessings of Mata for peace and prosperity in your family. We are expecting more than 100 Sindhi families of Thane to become part of this massive event. Raj Juriani who is well known Sindhi Music Artist is invited to perform on this event. Families will have opportunity to introduce themselves to all followed with delicious dinner at the venue. As noted before Thane Sindhi Club is FREE membership group. All you need to be is Sindhi to be part of our club. However to pay the cost of such big events we look forward to our members to generously contribute towards these event.